Scientists working on data collected the Philae probe have said that during a drill for a soil sample the Philae probe was able to "sniff" organic molecules. Earlier, incredible images showed the moment the Philae probe dropped from its satellite and first landed on Comet 67P five days ago. The high-resolution shots, taken by the Rosetta satellite's narrow-angle camera, capture the 30 minutes since the probe touched down on the comet's surface. At the moment scientists have lost contact with the probe after its batteries died. It will only wake up if enough sunlight recharges its solar panels. But the mission is still deemed a success as it is the first spacecraft to ever land on a comet. "We currently have no information on the quantity and weight of the soil sample," Fred Goesmann from the Max Planck Institute for Solar System Research told the DLR German Aerospace Center. The team behind the comet probe Philae say they are "confident" it will wake up again at some point. Lander manager Stephan Ulamec said he hoped to achieve contact again after the spacecraft's batteries died on Friday. But that might not happen until next spring, when Philae and the comet it is riding on - 67P/Churyumov-Gerasimenko - get closer to the sun, warming up a secondary battery on board. A few days of sunshine on the solar panels should be enough to charge the battery sufficiently to conduct science runs, Mr Ulamec said. His team are still waiting to find out whether Philae managed to drill into the comet and extract a sample for analysis. Material beneath the surface of the comet has remained almost unchanged for 4.5 billion years, so the samples would be a cosmic time capsule that scientists are eager to study. One of the things they are most excited about is the possibility that the mission could confirm that comets brought the building blocks of life - including water - to Earth. Thsee incredible images show the moment the probe dropped from its satellite and first landed on Comet 67P five days ago. The comet probe Philae is "asleep" after its batteries ran out and scientists were unable to recharge as it lay in the shadow of a crater wall. The systems on board the device, which made scientific history this week, have shut down, the European Space Agency (ESA) said. In a post on its blog, ESA said: "Philae has fallen into 'idle mode' - a possibly long silence. In this mode, all instruments and most systems on board are shut down." Contact was lost at 12.30am on Saturday morning and the next opportunity for communication is expected to be 10am. However, the mission, which is the first of its kind, has still been successful. Stephan Ulamec, lander manager, said: "Prior to falling silent, the lander was able to transmit all science data gathered during the First Science Sequence. "This machine performed magnificently under tough conditions, and we can be fully proud of the incredible scientific success Philae has delivered." It took 10 years for Philae and its Rosetta mothership to reach comet 67P/Churyumov-Gerasimenko after an epic journey across four billion miles of space. The Philae comet lander has regained radio contact with the Rosetta satellite and is sending data back to earth. There were fears its battery was about to die after it landed in the shadow of a cliff on the comet, meaning the solar panels were rendered useless. Now it is a race against time to see what information can be fed back before its primary battery is exhausted as it is unlikely the second batteries will charge up enough to extend the operation. The European Space Agency has released images showing the area where the Philae craft first touched down on comet 67P/Churyumov-Gerasimenko. After this landing the craft bounced and came to rest in a different area, which scientists say is away from the area shown in the images. 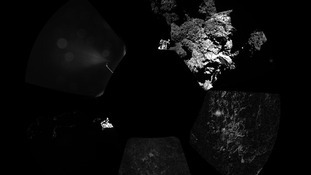 The images were taken by the Rosetta orbiter as it flew over the landing site. The first image shows the area just before the landing, the second just after. Scientists say the dark area in the second shot is strong evidence it is the landing site, with the green dot indicating the craft's designated landing spot. Scientists at the European Space Agency (ESA) are facing anxious moments as they wait for data to be sent back from the Philae lander. The craft should be sending data back from the surface of the comet it started drilling on earlier. But Philae is also facing an energy problem. It needs more sunlight to power its solar panels, meaning the ESA team may try to 'hop' it into a more favourable position. ITV News Science Correspondent Alok Jha reports. Comet probe Philae has started drilling into the surface of the comet which it landed on this Wednesday. But there may not be enough power left in the craft's depleting batteries to obtain scientific data from the samples it collects. An image of the Philae lander on the comet's surface. Philae is believed to be tilted to one side in the shadow of a crater wall and is not getting enough light to recharge its batteries using electricity generated by its solar panels. A British scientist working on the Rosetta project has apologised for his choice of shirt after a backlash on social media. Dr Matt Taylor was initially hailed as ‘cool’ for his colourful choice of shirt, which showed off his full sleeve tattoos. But a closer look revealed the pattern on the clothing was made up of scantily-clad women, leading to accusations that it was sexist. In a Google Hangout briefing on the latest developments in the project today, Dr Taylor appeared to be fighting back tears as he apologised. His colleague, flight director Andrea Accomazzo, even gave him a comforting pat on the shoulder as he composed himself. The shirt I wore this week – I made a big mistake, and I offended many people, and I’m very sorry about this. Scientists racing against time to keep the Philae comet lander operating are debating whether to try 'hopping' the probe to a new location.